Fab-Line Machinery continues to offer industry-leading fabrications solutions to our customers with the introduction of the Gemini. Our latest addition to our product line, the Gemini press brake is the answer you have been looking for. The Gemini is a cutting-edge piece of machinery that eliminates the problems that come with taking on occasional “long work,” or bending metal that is too long to fit in a standard press brake. While the usual answer to just own a separate press brake large enough to handle the “long work,” we have created a solution that focuses on one thing: versatility. The Gemini is essentially two standard sized press brakes that are capable of working together to double their length and tonnage for larger projects. They can also work independently as standard press brakes, offering you unseen versatility on the fabrication floor. Taking on a wider array of jobs has never been easier with the unmatched adaptability of the Gemini. Time is money on the fabrication floor, so why not go with the option that saves you time while opening up a world of possibilities? Come See the Gemini In Action! 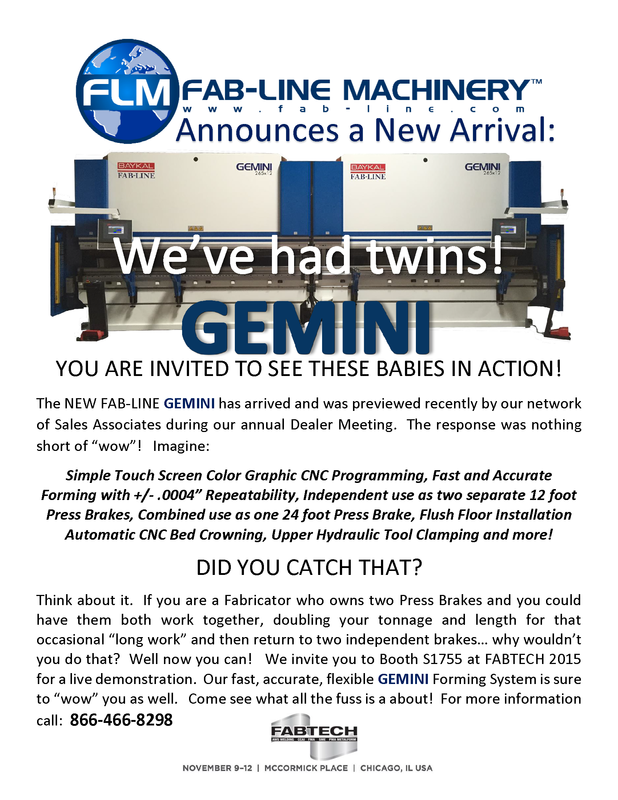 If you are interested in seeing what the new Gemini can do in person, you’re in luck. We will be conducting a live demonstration of our latest product at FABTECH 2015 in Chicago from November 9th until the 12th. Find us at booth S1755 to see what the Gemini can do for you! If you have any questions about our new Gemini press brake system or any of our other outstanding products, don’t hesitate to visit our website or give us a call today!